Millions use their iPhones and Apple Watches as their wallets. Now Apple's providing something to help fill them. Backed by Goldman Sachs and Mastercard, the Apple Card is a new credit card that's deeply integrated with the Wallet app. It uses machine learning and Apple Maps to help label all your transactions, breaking them down by category with weekly and monthly spending summaries. Cashback rewards come to the Apple Cash card on a daily basis — no waiting for the next statement — and there are zero fees, even for late payments. For those times when Apple Pay isn't an option, they'll also be issuing physical cards that are made from titanium, with no card number, security code, expiration date, or signature on the card for would-be scammers to steal. Coming this summer. The iPod promised a jukebox in your pocket. Apple News Plus puts a whole newsstand there. The new subscription service offers access to over 300 magazines across a wide swath of topics, as well as a handful of digital publications, the Los Angeles Times, and The Wall Street Journal. 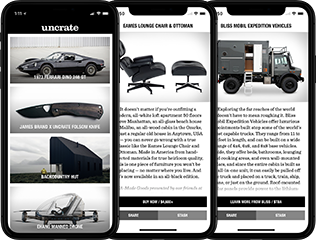 Each article is formatted specifically for the iPhone and iPad while maintaining the publication's unique typography and design sense, and as with standard Apple News, it's completely private with no advertiser tracking. Designed in partnership with Lenovo, the Rift S is the rare evolutionary product that looks quite different from its predecessor. Compatible with the Rift platform, it bumps the per-eye resolution to 1280 x 1440, improves the lenses while moving from OLED to LCD screens, and has five onboard cameras for tracking. It also ships with updated Oculus Touch controllers and has a rigid halo design with near-ear speakers, instead of a flexible strap and on-ear headphones. System requirements are largely the same, and it'll launch later this spring. The Club Campus family is one timepiece stronger and much sportier after the 2019 Baselworld announcement of the Club Sport. The Nomos timepiece expands the Club line with a new in-house automatic movement, and an unexpected all-new steel bracelet. Departing from the watchmaker's norm of only using leather and fabric straps, the steel bracelet is crafted in-house with 145 individual parts and an elegant deployment clasp. The watch also has an impressive 300 meters of water-resistance, a screw down crown, and a dark marine black dial with numerals, hands, and typography that are loaded with Super-Luminova — ensuring you're more than prepared for your next trip underwater. A red ring on the inside of the crown acts as a visible warning if it's not secure before you dive beneath the surface. Small seconds and date complication round out the timepiece, and the neomatik date caliber is protected by domed sapphire crystal with anti-reflective coating inside and out. The Club Sport might be one of the toughest Nomos timepieces to date, and a versatile blend of a dress, dive, and everyday watch with a sporty feel. Uncrate is an authorized dealer of NOMOS Glashütte timepieces, extending their full warranty with purchase. Inquire directly with Uncrate about purchasing a NOMOS Glashütte timepiece. Being the little brother to one of our favorite catch-call charging valets, the Courant Catch:3, the Courant Catch:1 is equally as well built and better for smaller spaces. It uses the same premium pebble grain Italian leather wrap and weighted matte aluminum alloy chassis as the Catch:3, and features Qi-Certified fast wireless charging that will charge both a naked device or a device housed in a case up to 3mm thick. It's compatible with most every wireless charging model from Apple, Samsung, Google, and others, and thanks to USB-C charging can be used around the world. Dimensions: 3.9" / 3.9" / 0.6"
Crafted from pebble-grain Italian leather, Courant's CATCH:3 Charging Station will keep your most important device juiced up while keeping the rest of your EDC kit organized. Its 3-coil, Qi-compatible platform supports fast charging of both iPhone and Android devices, powered by an included nylon USB-C cable that connects discreetly in the back. A recessed, bowl-like area sits alongside, holding your watch, wallet, keys, and any other essentials you'd like to keep handy. A weighted matte aluminum alloy base keeps it from sliding around, and an additional USB-A output lets you charge a second device if desired. Width: 11.0" / Depth: 8.0" / Height: 0.625"
Holidays are great times to make some memorable photos. The HP Sprocket Photo Printer lets you share them, instantly. Small enough to slip into a coat pocket or bag, it lets you wirelessly print out 2x3-inch snapshots or stickers directly from your phone, whether they're in your camera roll or on social media. The companion app lets you add filters, borders, emojis, and drawings before you print, and it uses commonly-found Zink photo paper. Brooklyn-based Krink is famous for their inks and markers, formulated specifically for graffiti. Now they're taking the next step and producing a tool for large-scale projects with a signature drip. The hand-pressurized sprayer has a black plastic body with bright white branding, a stainless steel wand, and an adjustable brass nozzle, and is sure to be seen in the hands of the world's most talented street artists in short order.